Pierate - Pie Reviews: Leeds Pie Tour: Insect Pie! As you can see from our Leeds Pie Tour video, we enjoyed some take away pie options from Pieminister. We have reviewed over a dozen of their pies before but nothing quite like the British Pie Week special known as 'The Hopper'. Believe it or not, in an attempt to produce something a bit different, Pieminister have gone for a pie containing cricket insects. We have eaten many usual pies, from Python to Squirrel, but this must surely go down as one of the weirdest! Was this just a disgusting gimmick from Pieminister or was I bowled over by the cricket pie? As you can tell from the video, it took a bit of getting used to. I had expected the crickets to be in small pieces and difficult to discern when mixed in with the rest of the filling. But, in order to not disappoint those who were looking forward to crunching on invertebrates, the pie had plenty of whole crickets in all their exoskeleton glory. That said, the pie was not overly heavy on the crickets, this was, after all a Mexican chipotle chili, black bean AND cricket pie with plenty of other ingredients. I had expected a bit of crunch from the crickets, however, they were surprisingly soft. There lay the problem, the crickets didn't really seem to add much to this pie apart from perhaps a bit of protein. They didn't seem to add any flavour or texture and I suspect they could have been replaced by more black beans without making much difference. Therefore, it does seem like this pie was a bit of a publicity gimmick. 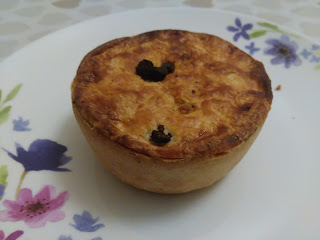 However, this didn't stop it actually being a very flavoursome pie, the smokey chipotle chili flavour went really well with the signature Pieminister crispy pastry. The only downside was that the pie was a bit soft, there wasn't much to get your teeth into. However, it was enjoyable and actually, now I am used to the creepiness of the filling, it is something I would be happy to eat again! So the shock summary from this review is that the insect pie from Pieminister actually receives a Pierate Recommended award for scoring over 5 out of 7!